Have you seen our paper plate dragons? My preschooler is currently on a dragon kick and we've been reading dragon books, watching dragon movies, and making dragon crafts... of course! If you have a dragon lover at home, then you'll love this craft too. I've even included a template so that you can easily make these paper plate dragons with your little ones too! 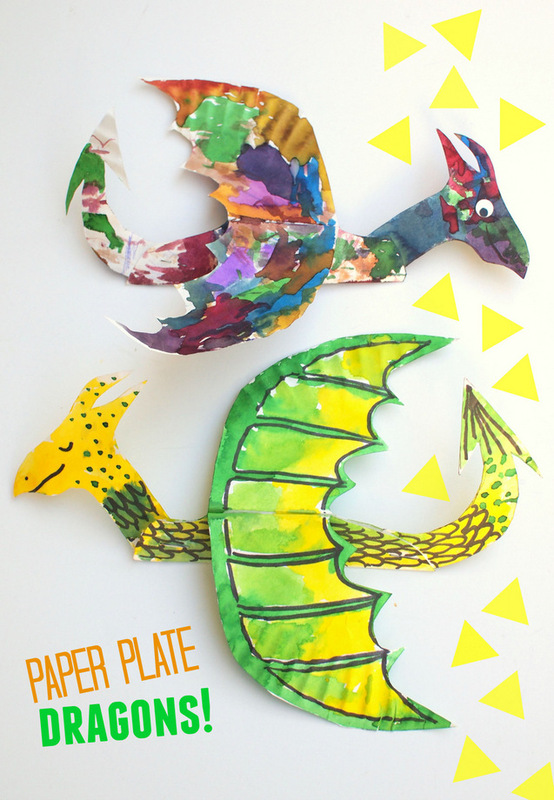 Make these Colorful and fun flying paper plate dragons! Alright, let's make ourselves a paper plate dragon! Then, I cut out the head and tail pieces from the excess material. We also folded down our wings. Then, I slid the head and tail pieces between our body pieces and stapled everything together. and here's the rainbow one that my son painted! And if you're looking for more dragon crafts, check out the links below! Thank you so much for sharing this craft. I am not crafty and my kids were so excited to color this. Your template and directions made the craft very easy. so glad you enjoyed this craft! These were so fun for my class of K-2nd graders! It went perfectly with the book we read that day--Dragons Love Tacos! Thanks for the template, it made the dragons so easy to make! A couple of kids even cut out fire to glue to the dragons' mouths (since that's what happens in the story). Thanks again, I will keep this craft saved for many classes to come!!! awesome!!! that's one of our favorite books. so glad you enjoyed this craft! This looks so cool! Cant wait to try this with some kids!!!! Thank you so much. Great! :) Thanks for visiting!